In Part 1, we listed key factors to consider before zeroing in on your preferred pool shapes, including how elements of some can factor into construction costs. Now, let’s take a look at some common pool shapes; one by one, we outline some of the advantages that certain ones have over others. Being familiar with variables of each pool shape can be valuable. The more informed you are, the better prepared you will be to make good choices as you embark on designing a backyard addition. Something of a throwback to the Fifties and Sixties, a kidney shape were once among the most popular for residential pools. Today, they are less common, but kidneys are still a hit with those who like their simple, utilitarian style. They are also a favorite for maintaining the historical style of a Mid Century modern home. A kidney shape consists of a simple curved form with an indentation on one side. It is highly versatile for various design and functional goals. The shape lends itself to a natural division of the shallow end from the deep end—an important consideration if young children will be using the pool. Space near the kidney’s indentation can be used for special design features. For example, a pool bench can go outside the perimeter shape, or this nook can be the perfect place to integrate a pocket of landscaping. Lap swimming is also an option if the kidney is properly designed for this activity. Ideally, the length will be 40 feet, although shorter spans can suffice. The configuration needs to allow for a clear swimming path; to do so, features like steps or the spa must be set off to the side of the pool so they won’t interfere with the swim path or with swimmers making turns at either end of the pool. Kidney shapes can be a smart choice for those on a budget. The curved design allows for more square footage of actual swimming area—but with lower perimeter footage, which costs more to build. (See the section “How pool shape impacts construction costs” in part 1). A kind of successor to the well-known kidney is a Figure-8 pool. The shape represents a more contemporary take on its older, more famous cousin. Essentially, the shape consists of a small oval atop a large oval—yes, just like a number 8—but with a thicker middle. It offers design and functionality attributes comparable to the kidney, but it with a more current style aesthetic. Better yet, a figure-8 typically provides more swimming area than a kidney for even greater savings on the purchase price. Rectangular pools with perfect 90-degree corners have been around for decades. They are ideal for swimming laps or engaging in other types of water exercise. The familiar shape conveys a sense of formality, as well as a sleek, modern feel. For greater design options, rectangles can be modified. For example, you can round off the corners to soften the silhouette or include a round spa at one end. If your backyard is long but narrow, a rectangle can remedy the space challenge. The solution is a “skinny” rectangle—a pool with a long span, but a narrow width of only 8 to 10 feet. When it comes to construction, take note: Rectangular pools typically cost more than curved pools. The reason why is increased perimeter footage. Rectangles may require more square footage in a backyard. A perfect rectangle provides zero flexibility to incorporate or allow for the intrusion of other structures. If part of your house or a tree you want to preserve is blocking one side of the intended position of the pool, the size will have to go smaller. The alternative here is to modify the rectangle. Typically this involves removing a corner from the shape to preserve the overall pool size. So, unless you either have plenty of space, want a small pool, or are happy with a modified rectangle, you will need to devote ample backyard space to this pool shape. If you plan on including a pool cover, a rectangle is an excellent choice. Covering this basic shape is easy, especially when using a motorized pool cover with railings and fixtures that make the cover slide open and close. When it comes to cleaning, some rectangle pools—as well as many geometric shapes outlined below—pose a small challenge: When certain structural features—such as a spa, steps, or special element—are incorporated into a straight-edge pool shape, tight corners may be created. If so, some models of automatic pool cleaners tend to get stuck in these spots. An offshoot of the rectangle, the L shape is a good choice when you want a pool for diving or swimming, but also want a large shallow area for play activities. Typically, the small extension or “foot” that extends from the main section gets used for the shallow end. This configuration allows youngsters to play in one area without interfering with anyone diving or doing laps across the long span. The lazy L is similar, but it has a shorter offset—more like a “foot.” This variation provides a look very close to a plain rectangle. Often, a lazy L is used to create a rectangle for lap swimming with a spot to locate the entry steps off to the side; this way, the steps don’t obstruct the swim path. If you want a pool for diving, an L shape can make it easier to meet code-depth requirements. For example, in a pool with an 8-foot deep end, 22 feet of length must be at least 5-feet deep. The result may be a steep slope—which is not ideal for some families. The L offset offers a safe entry and play area while allowing for a more gradual slope to the deep end. If you want diving and play areas in the same pool, a related shape that fits the bill is the T-shape pool. This highly functional design features the diving area on one end of the T and the play area on the opposite end. However, homeowners frequently pass on a T because it requires a great deal of space, and the extensive perimeter footage drives up the construction budget. Unique, custom shapes composed of straight lines that may also incorporate sections with curved lines. Choosing a true geometric design often comes down to a desire for their simple, universal kind of shape and practical nature. On the other hand, the custom version is preferred by those seeking distinctive, non-traditional configurations. Typically, geometric shapes provide the foundation for a modern, contemporary pool design. They fit in particularly well with houses composed of many exterior angles—common with modern architectural styles. However, certain geometric shapes—particularly the true ones like ovals and rectangles—are frequently used in traditional, classic backyard settings as well. Compared to a curvy pool with soft, rounded lines, a straight-edge geometric shape may be better suited for incorporating certain formal and modern decorative features. For example, say your backyard plan is for a minimalist look. Smooth, cantilever decking will achieve the design objective very well, and it pairs beautifully with the angles on a straight-edge pool shape. You can even have the shape of a custom geometric pool follow or “mimic” the angles of your home’s footprint. Doing so may provide another benefit: tracking the home’s footprint efficiently uses limited real estate, thereby maximizing limited backyard space. Depending on the final shape, a custom geometric may carry a higher price tag. Due to their increased perimeter footage, these designs generally cost more to build than do curvy shapes. Considered by some as a subcategory of geometric pools, the classic shape has been around for a long time. In fact, the design harkens back to centuries-old Greek and Roman architecture. Classic pools elevate simplicity to elegant style. They combine a rectangular shape with a combination of radius and angled modifications—usually at both ends of the pool. Classic shapes come in two types. Grecian and Roman. The Grecian is a rectangular shape in which the angled corners are modified. With an authentic Grecian, the shape essentially lops off the 90-degree corners. A more popular, updated version replaces the 90-degree corners with soft, inward-rounding. Do note that both versions reduce the usable square footage of the pool. Romans are far more popular than Grecians. With the Roman, the entire ends of the rectangle are rounded off. Typically, both ends of the pool will be rounded. However, you can also have what’s called a “half Roman” with only one rounded end. This version is a good approach if one side of your pool will be built flush up into raised bond beam or a retaining wall. Roman and Grecian pools do a great job complementing classical architecture and formal backyards settings. Think Hollywood mansion or East Coast estate. However, theses shapes provide surprising style flexibility as well. Using tailored variations of either—coupled with strategic choices of building materials—these classic shapes can take on a modern aesthetic or even blend into a rustic setting. One important consideration with a classic shape is the addition of a spa or other specialty feature. Options for placement and configuration may be limited; if your heart is set on a perfect Grecian or Roman shape, including a spa may alter the overall silhouette. Opting for a “half” classical will make incorporating a spa easier. A free-form is what it sounds like—no hard rules on shape. Intrinsic to this design is that it can take on virtually any curvilinear form. 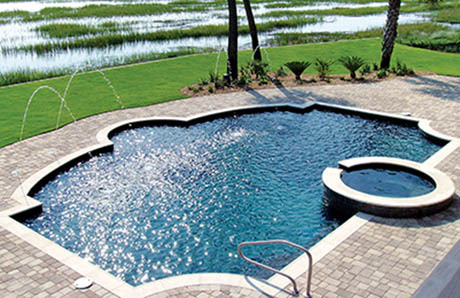 Due to their use of curvilinear lines, free-form pools are sometimes referred to as radius pools. Technically, any pool with rounded areas (such as a kidney) can be considered a radius pool. However, most pool designers use the term “free-form”. Within the free-form category, one shape version is fast-becoming a favorite among pool buyers in some parts of the country: Known as a cloud or bubble, the shape looks like the names suggest. Whether it takes shape as a more-defined cloud or bubble or a one-of-a-kind, curvy configuration, a free-form pool conveys certain qualities into backyard design. Homeowners often choose these soft, flowing shapes to create a tropical, natural style lagoon setting. The free-form shape can also do a good job accommodating large tanning ledges without interfering with the diving or swimming area of the pool. Curves also work especially well if your goal is to soften the hard appearance of a small rectangular yard or a home with lots of sharp angles. Another determining factor: If you follow the Feng Shui design philosophy, experts in this field usually suggest a free-form pool. If you plan on using a pool cover, the irregularity of a free-form pool will be more challenging, and some shapes will require you order a customized model of cover. With so much versatility of what a free-form shape can take, the budget may follow suit. The cost of a free-form pool will vary depending on how creative you get. The message here is that one kind of pool shape is not “better”. It all comes down to your needs, preferences, and other variables outlined here and in part 1 of this article. Now that you know more about some of the benefits and limitations of each shape, you can work with your pool designer to identify which best fits your overall goals and choose the perfect one for your new backyard resort.